To my knowledge, people generally do not purposefully go to the grocery store to purchase a potted plant from the floral department; or have it on their shopping list unless maybe at Easter. Frequently, it is a purchase made on the way to a friend or family members home as a gift to the host, or as an impulse buy for yourself when you are feeling particularly over worked and under-appreciated and decide, so rightly so, that you deserve this small spot of beauty to brighten your home! The potted plants are often flowering, and beautiful, and overall wonderful. As with most things, the choices available depend on the season- miniature roses, Gerber daisies, English Ivy, mums, and poinsettias are for other times; in spring it is false shamrocks, tulips, daffodils, Easter Lilies and kalanchoes! The ones in the spring are the most tempting; we have waited so long for color! Do not be denied the chance to take that brilliant yellow or pink home, just know some special facts about how to care for them and what your expectations for them are, the same way to approach all plant care, really. Native to Brazil, the False Shamrock (Oxalis triangularis) is popular in February and March due to its striking resemblance to the Irish shamrock. Found in both green and purple, this long-lived plant grows from bulbs and is a great addition to most home environments. It likes bright light and cooler temperatures, and pots with good drainage. They have natural dormant periods usually occurring in mid to late summer, and can go without much water or light during this time. Just set it aside, and watch for re-growth in about 6 weeks to resume regular care. Easy! Finally, what self-respecting grocery store floral department would be without pots of flowering tulips, daffodils or hyacinths to tempt you? Isn't that such a great bargain, to enjoy them now and then again year after year? Well, maybe, but probably not. Bulbs that have been forced to bloom have spent much or all of the plant's food reserve and struggle to recover completely. However, if you are an optimist, you can try to get them to flower the following spring. Cut off the stems when the flowers are spent, but leave the foliage. Keep the plant in a bright light and water as usual. When the leaves turn yellow stop watering and store in a cool, dry place. Re-plant outdoors in the fall as you would any spring flowering bulb; and be sure to fertilize. Sometimes, they will successfully re-bloom; with the daffodils being a bit more on the successful side than tulips or hyacinths. Maybe it will take two years, maybe one year, maybe not at all. Nevertheless, try, because you have nothing to lose and more to gain. Just don't place too much pressure next year on those same bulbs though, have a backup plan in place. 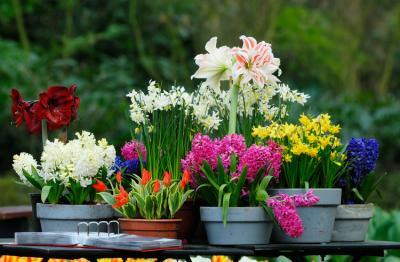 Plant new bulbs for fall planting outdoors to fill in areas the indoor bloomed ones may not. Or, plan a trip to the floral department at your local grocery store for spring blooms- put it on your grocery list even.